Sarangani province is set to become a top destination for air sports tourism in the Philippines with its successful hosting of the first International Paragliding Accuracy Competition (IPAC) at the San Andres Fishing Industry or SAFII Ranch Paragliding Site in Maasim, Sarangani. IPAC 2014, which has been accredited by the Federation Aeronautique Internationale, was endorsed with a pre-world status. 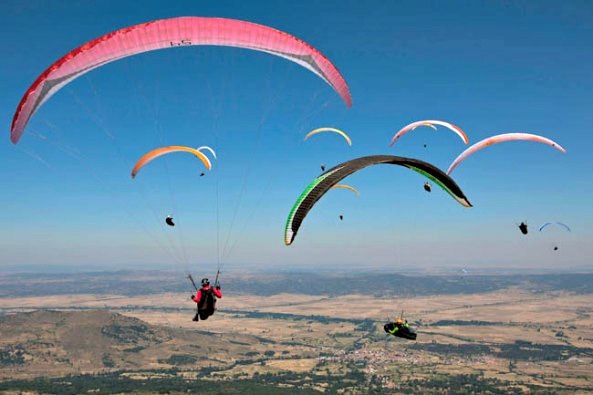 The event is in preparation for the 8th FAI World Paragliding Accuracy Championship in Puncak, Bogor, Indonesia in 2015. "The international paragliding accuracy competition is one of the best ways to promote Sarangani Province and the whole region especially if they will be able to organize a celebrity edition as it will heighten the interest not only in air sports but also in Sarangani’s tourism,” Department of Tourism (DOT) Assistant Secretary for Mindanao Arturo Boncato Jr. said. Actor Ian Veneracion and his children were among those who added glitter to the event last weekend in Sitio Seguil, Barangay Tinoto in Maasim town. Veneracion, who is a licensed private pilot and a paraglider, officially participated in the competition as part of Team Philippines while his son and daughter flew fun flights in between competition sessions. Boncato said a total of 39 pilots from 11 countries namely Taiwan, Indonesia, Philippines, Australia, Spain, USA, Malaysia, Singapore, Germany, United Kingdom, and Japan participated in Sarangani’s IPAC 2014 which was organized by Air Sports Adventure Philippines in cooperation with the Sarangani Bay Paragliding Club. Team Indonesia was declared as group champion while a member of Team Taiwan who was declared a champion in the individual category was also named most accurate paraglider. The province was chosen as the location of the competition because of its good weather condition. The province has an estimated 300 flyable days in a year, a refreshing sea breeze ideal for paragliding, tropical thermals with a good landing plate, smooth sled rides and a 5-km ridge. Boncato said the event is expected to open a lot of possibilities for the province not only in Air Sports but also in tourism and trade. He said the successful staging of the event will definitely boost the province’s bid to host other paragliding events in the future. Michelle Solon, chairperson of the Regional Tourism Council said paragliding is indeed the next best thing in Region 12. The Sarangani Paragliding Club offers training and tandem flights for those who want to experience the sports or who seriously want to become pilots. A 10-minute flight would cost P2,300 while a longer 15-minute flight would cost P3,000. The SAFII Paragliding site is included as one of the destinations in the recently-launched 12th Paradise campaign for Region 12.